As a child I lovingly recall Christmases with my family. It was tradition for my grandparents to feed all the town’s elderly or handicapped that would have otherwise spent Christmas alone. My pap and his friends would drive around town making pick-ups all day long. I would sit on the steps and listen to the laughter and chatter all day long. These were my favourite Christmases. My Nanny and my Mom and grandma (aka Nanny) would start cooking days in advance for all of the guests that would come. Cookies, cakes and nut rolls would be made weeks in advance and frozen. Turkey, ham, chitterlings (pig’s intestines for those that don’t know), mac and cheese, spinach casserole, greens, candied yams, and the list goes on. I would sit in the kitchen as they gossiped and prepared the feast. As they worked they would task me with jobs safe enough for little fingers. Blocks of cheese as long as my six year old arm would be laid in front of me; a box grater placed in my hands; I would be set at the table for what seemed like two rotations of the sun. I would grate and grate and grate. I would grate until my fingers were cramped and I could no longer feel it when I would grate tiny slivers of finger tip into the bowl. I grated so much cheese as a child I think it borders on child abuse. And this happened every year of my childhood. Needless to say, I hate grating cheese. Fast forward to last week. I picked up my new best kitchen friend at Costco. It’s simply the bee’s knees. Let me introduce you to the Tefal Fresh Express Max. We’ll call her TT for short. My girl slices, she dices, she chops, she grates, she just amazing! I got her for £50 (but the suggested price is £80). Let me just break down the details for you. First, what’s in the box? Ok, so this was a bit tricky. The instructions were useless. Imagine IKEA instructions 10 times worse. There is a written section but it refers to the pictures that don’t make any sense so they’re pointless. It took two of us about 20 minutes to figure out how to put it together. It’s quite simple once you get it but it’s not intuitive. To attach the spouty thing, you have to insert it with the spout pointing to 1 o’clock then turn it counter clockwise to click in place. The blades don’t actually click in place and it seems like they might fall out but they don’t but you have to put it in and jiggle it lightly until it doesn’t fall out. Then you’re pretty much set to go. The machine has two speeds, slow and turbo, with instructions to indicate which type of cutting with which type of food works best. Just hold down the on button (which is giant and red on top so you definitely can’t miss it). Put the food in the spout and use the plunger to push it down and voilà (remember to put a bowl in front to catch everything). 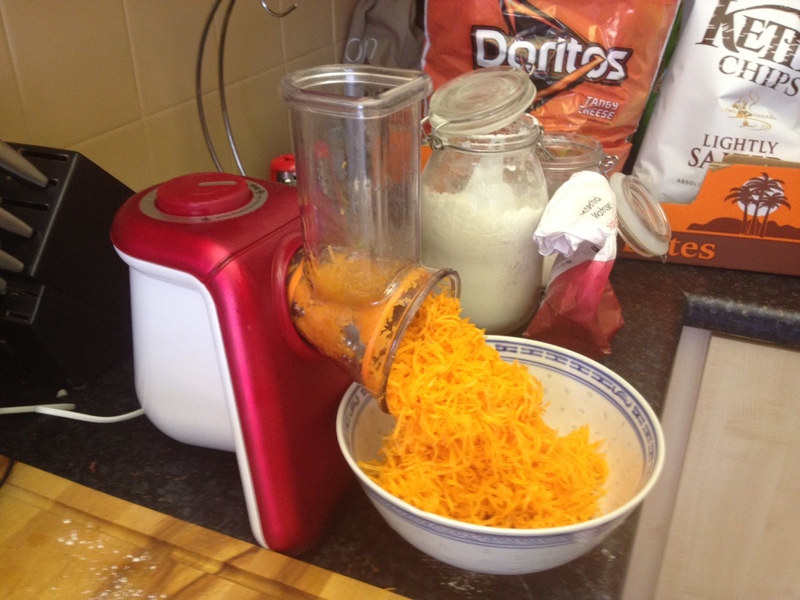 I grated 300g of carrots in about 20 seconds. I made two gallon sized bags of coleslaw mix in about a minute. The thing handled carrots and two types of cabbage easily. I even chopped pickles to make tartar sauce. The only thing it didn’t do was chopping tomatoes. That seemed to perplex little TT. I ended up with a lot of tomato juice and the flesh of the tomatoes just kept spinning on the outside of the blade. I’ll try slicing tomatoes and let you know. The best part is that I grated a 6×6 inch block of cheese in about two minutes. AMAZING. What could make this even better? Nothing. This is already so very amazing but TT is even easy to clean. For all of the food (except cheese) I simply ran the blades and the spouty thing under a warm tap for a few seconds and it was completely clean. The cheese took a bit longer (about a minute) to clean. The attachments are all dishwasher safe (top rack) but they’re so easy to clean, why put them in there. Finally, everything stacks nicely and neatly and sits in a corner. The cons of this I can’t find many but if you force me to say something I’d say it would be nice if I could set the thing to stay on instead of holding it to keep the blade moving. It would also be nice if the contraption came with a matching bowl. That’s really all I can think of. I love it, I would buy it again. It cuts my kitchen time by half. It’s compact but powerful and easy to clean which makes it a great tool in my eyes. The price at Costco is just right however, at £80 I would have to think more about it (and then purchase it anyway).